Is Assad overplaying his hand? The head of the Lebanese Shia Islamist movement Hezbollah, Hassan Nasrallah, has made a rare public appearance in the Syrian capital, Damascus. 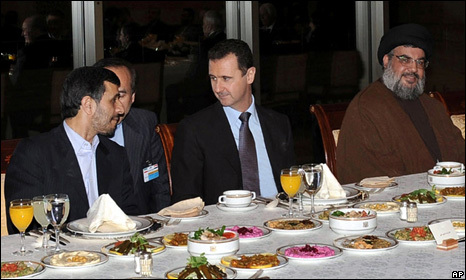 Sheikh Nasrallah attended a dinner with Syrian President Bashar al-Assad and Iran’s President, Mahmoud Ahmadinejad. This is part of a visit to Damascus from Iranian President Ahmedinejad. Predictably, as a result of this meeting – and spectacular photo-op (see above) – Israel is calling on the US to delay sending its new envoy to Damascus. How the US respond to this is interesting. It is highly likely that Obama and co will ignore Tel Aviv’s calls and continue engaging Syria as they plan. However, perhaps Assad should be cautious not to overplay his hand on this. Whilst Syria clearly has no intention of severing its ties with either Iran or Hezbollah – they give it regional prestige as an intermediary for the West to talk to – Damascus must be aware of the debate about engagement with Syria currently underway in Washington. Evidently, Hilary Clinton and others have been arguing that engaging Syria is part of the wider, more pressing issue of dealing with Iran, and are trying to sell this idea of ‘detaching’ Damascus from its alliance from Tehran. This debate is still far from won in the US and there were many objections in the right wing press, notably the Washington Post, following Obama’s decision to appoint a new ambassador. It strikes me that whilst Syria need not even pay lip service to this theory that they can be ‘flipped’ it is important at this delicate stage not to appear to be overtly reject it. Photos like the one above will make it much harder for pro-Syria engagement advocates in Washington to win the argument. Perhaps it might have been wiser to reassure Iran privately of Syria’s good intentions until the US ambassador had arrived and relations normalised, and leave the more public endorsement seen above until later down the road. That said, in a game of brinksmanship, Assad might still win this one. If the US ignores Israel’s pleas and sends the envoy on time, the extent of Obama’s realism will be there for all to see. Syria will feel legitimized in being able to maintain its ties with Iran whilst reengaging with the US. Watch this space. “Police in Turkey today detained more than 40 high-ranking military commanders for allegedly plotting to overthrow the Islamic-rooted government. The arrests highlighted the ongoing struggle between the secular establishment and the government and leaves question marks over the traditional role of the military as the pillar of the secular state…. The military’s image was already tarnished by allegations it was secretly planning to depose Erdogan’s elected government for undermining secularism in the predominantly Muslim but officially secular country. The commanders detained today are reportedly accused of seeking to foment chaos by blowing up mosques to trigger a military takeover. The military denies the accusation…. The detentions followed revelations of wiretap evidence and the discovery of secret weapons caches, which dealt a blow to the military’s credibility. The brilliant but often overlooked digital channel BBC4 is midway through a fantastic series charting the lives of everyday children growing up in the Syrian Schools System. I recently caught the second episode which followed the lives of four Palestinian Syrian girls living in Yarkmouk ‘refugee camp’ in southern Damascus. We see two of them struggle to convince more conservative elders that rap music is a new and effective medium to tell the story of the stateless Palestinians still living in exile after 3 generations. A similarly touching tale shows a girl hoping to compete in the national schools discus championship, only to be held back by her traditional father. Eventually, aided by her supportive grandmother, she is able to take part in the competition at Tishreen stadium, converting her father to her cause along the way. The program, which still has three episodes to go and can be watched on iplayer by UK viewers here, is a great introduction to Syria for those who have never visited. Having taught in a Syrian school myself, it really does seem to be a fair reflection of the life there and hasn’t been particularly ‘polished’ for TV. Hopefully, if British viewers get to see this kind of everyday life, which shows Syrian teenagers to (obviously) have much the same interests and concerns as their western equivalents, barriers can be broken down. A good step in the long process of debunking inaccuracies and misperceptions of Syria and the Middle East in general. Turkey’s reengagement with the Middle East in recent years has been widely misunderstood. The AKP government’s perceived falling out with long-standing ally Israel, its drawing closer to Syria, Iraq and Iran, and a seemingly less enthusiastic approach to EU accession has led many to conclude that Ankara is shifting Eastwards in its foreign relations priorities. Yet this reorientation should not be over-exaggerated. Far from abandoning old alliances in the West for new friendships in the Muslim world, Turkey is instead settling into a new role as a regional power that was thrust on it after the power vacuum produced by the Iraq war and a decade of economic growth. To an extent, Turkey’s past disconnection with the Middle East has been exaggerated. Turkey’s longest borders are with Arab states and basic issues such as security and trade have long been discussed between governments. Nevertheless the extent of Ankara’s involvement since 2003 is substantially more than before. Turkey has concluded free-trade and visa-free agreements with Damascus, Baghdad and Tehran, and has invested heavily in each economy. Improved ties with Syria have been particularly fast-paced. President Bashar al-Assad became the first Syrian leader to ever visit Ankara in 2004, after 60 years of relations, yet now trade between the two states has doubled and April 2009 saw the first ever Syria-Turkish joint military exercise. Parallel to this, Turkey’s older political, economic and military alliance with Israel appears to foundering. Prime Minister Erdogan heavily criticised Tel Aviv’s assault on Gaza in winter 2008-9 and subsequently cancelled joint military exercises. Many see the various diplomatic spats that followed, coupled with the AKP’s Islamist origins, as evidence that the alliance cannot last. Yet such an analysis is too Middle East focused and ignores the wider changes in Turkey’s foreign policy. Since the Iraq War, the AKP have pursued an increasingly realist foreign policy devised primarily by Foreign Minister Ahmet Davutoglu. He argues for, “zero problems with neighbours,” whatever their past or current misdeeds. This has allowed the regime to put aside its ideological differences and historical disagreements with not just Syria, Iran and Iraq, but also older enemies in Armenia, Greece and Russia. Israel, whilst also a neighbour, had a privileged position in the past and, in effect, Erdogan’s admonishing has simply stripped it back to a place of average importance. Yet there is no chance of the alliance ending completely. Military cooperation in particular is deep and unlikely to end. Moreover, even Turkey’s Arab allies in Syria have voiced their support for a continued Tel Aviv-Ankara alliance, recognizing its ally’s ability to restrain its enemy. Another reason behind Turkish reengagement south is its desire for new markets. Following an impressive decade of economic growth, Davutoglu advocates increased Turkish ‘strategic depth’ with its neighbours – promoting its cultural, economic and political influence further than in the past. Turkey’s under-developed Middle Eastern neighbours may provide appealing markets, but they will be explored alongside, not instead of the European trade that built Ankara’s strong economy. Finally, Turkish reengagement is based on military necessity following the collapse of Saddam’s Iraq. Still fighting Kurdish insurgents in its south, Ankara fears instability in the Arab states will provide safe havens for its enemies to rearm and train. This fear was demonstrated in 2007 when Turkey invaded northern Iraq to smoke out Kurdish rebels. A desire to use its economic, political and military clout to co-opt stability in its southern neighbours is therefore driving policy more than any desire to refashion the region around its interests. Turkey may be reengaging in the Middle East both out of necessity and out of choice, however this does not mean ideological realignment. Far from pursuing an Islam-centric foreign policy, Ankara is displaying the traits of an emerging realist regional power: extending its influence wherever it can, whenever it can. Amman’s Downtown district is no postcard picture. Whilst neighbouring cities Damascus and Jerusalem are blessed with ancient architecture, the centre of Jordan’s capital seems to be inspired primarily by 1960s Soviet aesthetics. Hemmed in by barren hills and subject to a never-ending deluge of polluting traffic that has blackened most of its grey concrete buildings, Downtown feels like its already operating beyond capacity. This is not surprising given Amman’s sudden transformation from a provincial backwater of 50,000 during the Second World War into a bustling metropolis of 2.5 million today, caused by numerous waves of Palestinian refugees crossing the Jordan river, first in 1948, then again in 1967. These refugees and their descendents have long outnumbered the original ‘East Bank’ Jordanians, yet their integration and acceptance into the social, economic and political fabric of the Hashemite Kingdom is still far from assured. The Arab Middle East is the least democratic region in the world and it is getting worse, according to Freedom House’s latest Freedom in the World report. Only Morocco, Kuwait and Lebanon now pass as “partly free” while Yemen, Bahrain and Jordan have this year regressed into the same “not free” group as all the other Arab states. Jordan’s relegation is particularly alarming. King Abdullah II‘s decision to dissolve Jordan’s parliament barely two years into its term, and delay fresh elections until late 2010 was interpreted by Freedom House as “an attempt to manipulate the political process” and a decline in political rights. In spite of this, Jordan retains a carefully fashioned friendly image in the west and remains a key US regional ally, with Abdullah becoming the first Arab leader to visitObama’s White House in April last year. With US strategy under Obama seemingly shifting from democracy promotion towards stability-focused realism, is Amman’s backsliding the shape of things to come? 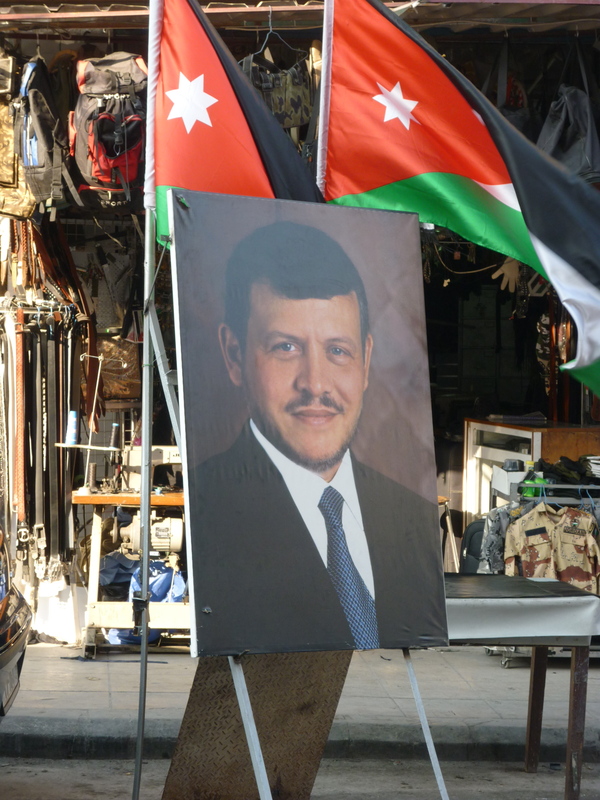 Is Jordan’s friendly-faced “autocracy lite” the best that democracy advocates can hope for? For decades Jordan has been viewed by the west as the best of a bad bunch in the Arab world. During the cold war the late King Hussein’s pro-American autocratic rule was deemed more benevolent than that of his neighbours in Syria, Iraq and Egypt, and hopes were high for the democratic reforms he initiated in 1989. Since then, Jordan has had an elected parliament with quotas for women, a partly independent press, increased civil society and cooperation with NGOs. It also legalised the Jordanian wing of the Muslim Brotherhood, the Islamic Action Front (IAF). Adding the shine to this friendly image have been the half-British King Abdullah and his glamorous Palestinian Queen Rania, darlings of the western media for their support for charities, progressive values and tolerance. Yet beneath the kingdom’s glossy surface lies an autocratic underbelly. Despite economic liberalisation, the political reforms of the early 1990s have stalled. While Abdullah talks the language of change, domestic supporters have grown frustrated at his inability or unwillingness to push reform past Jordan’s entrenched elites. No international observers were permitted during the 2007 elections, amid recurring claims that electoral boundaries were re-drawn to ensure a pro-regime result, particularly at the expense of Jordan’s under-represented Palestinian majority. Even this engineered parliament had restricted power, with the king legally able to rule for long periods without it. Furthermore, strict laws muted the fledgling independent press and Jordan recently slipped behind Egypt in its ranking for journalistic freedom. Human Rights Watch complains of regular prisoner abuse and of governors bypassing the judicial system to detain people without trial. The Obama administration, however, seems unconcerned by this creeping autocracy. Washington recently allocated an additional $150min annual assistance to the Hashemite kingdom, at the same time as Congress cut democracy and governance aid for Egypt and Jordan. Though the White House has spoken of support for reform in Jordan, notably in education, refugees and the assimilation of Palestinians, it also sees the benefits in continued support for undemocratic rule. Obama needs a consistent ally to fight his corner should he redouble his efforts in mediating the Israeli-Palestinian conflict in 2010, and won’t want to risk the instability of forcing reform. Furthermore, Washingtonmakes widespread use of Jordan’s Intelligence Directorate, recently highlighted by the gruesome murder of CIA operatives in Afghanistan. Such services thrive on the unaccountability of autocracy. The EU has proven equally reluctant to hold Jordan to account. Indeed,reports suggest that Jordan’s “strong commitment” to the social and economic reforms required as part of its Association Agreement are deemed sufficient to continue financial support despite the lack of progress in political and electoral reforms. It appears that western reluctance to promote and support Arab democracy is still shaped by George Bush’s failures. Bush’s aggressive attempts to democratise the Middle East were unpopular, ineffective and hypocritical. While some have noted improvements in Lebanon and Iraq as a result of Bush’s “freedom agenda”, the Bush administration also oversaw increased authoritarianism in Egypt and the subversion of democracy in the Palestinian Territories. Keen to rebuild America’s image in the region after such disasters, Obama has adopted a more restrained approach. But Obama should not abandon the cause just because Bush’s method was flawed. Opposing regime change should not mean opposing regime improvement. Jordan has shown a willingness to reform in the past and should be actively encouraged to do so again. Both the US and EU have vast reserves of soft power that they seem reluctant to use in promoting democratic change, most notably the huge sums of aid sent to Amman each year. Jordan has an internal reform movement upon which to focus and a seemingly progressive leader. If Jordan, with this potential and reliance on western aid, cannot halt its democratic decline, what hope for the more authoritarian Arab states?